What is a force? What does it do? What is a non-contact force? The first thing to say is you can't see a force! BUT, you can observe its effect and often quantify it with equations. The unit of force is the newton (N) and there are all sorts of forces e.g. A force is a 'mechanical' push or pull effect, acting on an object when it interacts with something or you can have forces of repulsion and attraction or from friction of materials rubbing against each other etc. The result of the interaction depends on the nature and magnitude of the forces involved. The value of force can be very small or very large, from zero to an 'immeasurable' value at the centre of a black hole! You are familiar with the results of electrical, magnetic or gravitational forces and mechanical forces such those acting in the spring of a clock or the engine of a road vehicle. You also will learn formulae to do calculations on gravity and acceleration. A scalar quantity only has magnitude (a numerical quantity, size), but no specific direction. A vector quantity has both magnitude (size) and specific direction. On diagrams vector quantities are usually depicted with an arrow, the length of the arrow can show the magnitude and the angle of the arrow shows the direction along which the quantity acts. In the diagram above, you have two cyclist travelling at the same speed of 2 m/s, but in opposite directions. Therefore, although they have the same speed (same length of arrow), they have different velocities because they are travelling in different directions. Note that the velocity of the left cyclist is formally given a negative sign to indicate the opposite direction of motion (it doesn't mean going slower or slowing down!). Forces between objects can be divided into two main categories. The interactive forces involved when two objects are in physical contact. The interactive forces when the two objects are apart, non-contact, described as 'action at a distance force'. Sometimes non-contact forces are acting between objects that are actually in contact e.g. you sitting in front of your computer is an example! This involves gravity (non-contact) and weight and compression (contact forces). See the flask standing on a bench example later. If two objects have to be touching for the force to act, the force would be described as a contact force. The two objects will be pushing or pulling on each other e.g. An object resting on a surface involves weight and compression (see 'interactions' section further down the page). 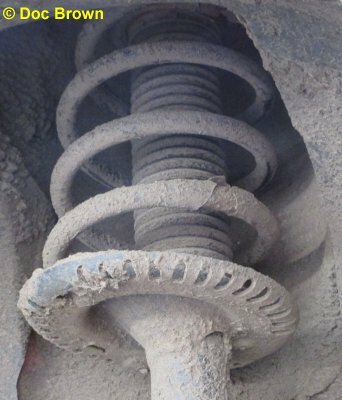 When a spring is stretched you have 'in tension' force as the spring tries to recover to its original shape acting against the weight or force applied to stretch it e.g. when you use a spring force meter in the laboratory or a spring balance for weighing things. the tension in the wires attached to the hook of a crane, if stationary, the tension in the cable is balanced by the weight of the object the crane is lifting. When dealing with major civil engineering projects like building a bridge, complex calculations must be done to ensure the bridge is stable and able to support the roadway with vehicles on it. Most of the forces involved in a suspension bridge design are those of tension and compression, illustrated with pictures and diagrams below for any budding young engineer! The Humber Bridge over the Humber estuary, north-east England, walked over and photographed in November 2018. When it was completed in 1981 it was the World's longest single span suspension bridge and in 2018 it still holds 8th place! Despite the obvious complexity of the bridge structure most of the contact forces involved are 'in tension' or 'in compression' forces which I've indicated by yellow arrows. Each of the two vertical towers of the Humber Bridge, consist of a pair of hollow vertical concrete columns. These support the weight of the two main 'sagging cables' - which actually comprise thousands of parallel steel wires (~15,000) bound together in a black casing. These cables in turn support the slightly angled (from the vertical) steel rods that support the roadway. Therefore there is a tremendous vertical force of compression acting in the two load bearing vertical concrete towers, as they must hold up the whole weight of the bridge! Within the 'sagging' main cable, and the almost vertical steel rods holding up the roadway, are the forces of tension. These are pulled downwards by the weight of the roadway and of the cables themselves. However, unlike the two towers which bear the whole weight of the bridge, the total force of tension is split between the main cable and nearly vertical steel rods. For this reason, the rods supporting the roadway can be relatively thin (62 mm diameter), but there are a lot of them! For more pictures see Humber Bridge in the 'doscpics' section of my otherwise science website! The bow and arrow! (the physics of 'Robin Hood' and the 'Battle of Agincourt' in 1415! 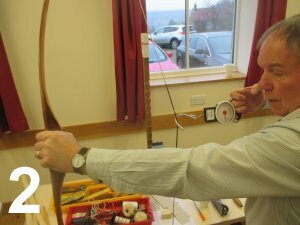 English longbow (picture 1 above), and other bows are classified by the tension in lbs on pulling the bow string to its maximum tension. In old 'weight' units this equates to typically 50 lb to 150 lb. 1 lb = 0.454 kg. Imagine these 'weights' hanging from the bow string. You can measure this with a spring balance by attaching it to the bow string and pulling it back and noting the reading (picture 2). 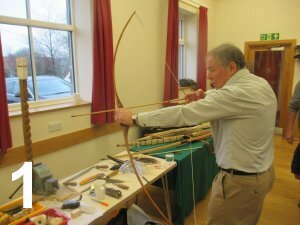 So the tension in the bow string is equivalent to hanging on it 'weights' of typically 23 kg to 68 kg. In terms of weight equalling the tension force in the bow string you multiply the mass by 9.8 N/kg (due to gravity). Therefore the tension in the string is typically 224 to 667 N, and the bow and arrow is now an elastic potential energy store! 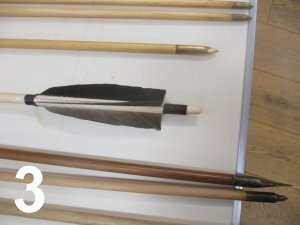 To reduce the force of friction between the arrow and air, the arrow shaft is thin and a sharp metal point at the front end (picture 3). When the bow is bent by drawing back the string, the string is in tension, AND there are forces of both tension and compression in the bow structure. On the inner curved surface of the bow you get compression as the layers are pressed together. On the outer curved surface of the arched bow you get the tension as the outer layers are stretched. When you let go of the arrow all this stored potential energy is released and converted into kinetic energy of the fast moving arrow. The drawn bow and arrow are an elastic potential energy store. The arrow becomes a kinetic energy store, much of it is retained on flying back down to Earth. As the arrow flies upwards it loses kinetic energy and gains its gravitational potential energy store. As it fall the GPE is converted back to kinetic energy and the arrow can be as penetrating as when first fired. The rapid firing of many longbows was a major factor in the English winning the Battle of Agincourt (1415) in the 100 years war between France and England. The French archers uses a crossbow that fires a bolt - deadly and very effective, BUT the bolt must be drawn back by a mechanical winding system to build up the store potential energy in the bolt mechanism. With no mechanism to deal with, just muscle power, a skilled English archer could pull back his bow and fire arrows at ten times the speed of the French crossbow men. No contest! Shakespeare built the whole thing up in his play "Henry the Fifth", he didn't know much physics but he was pretty good with words! (i) A falling object in air, experiences the non-contact force of gravity and the contact force of friction between the object and air - air resistance. (ii) Objects in contact will still experience the 'non-contact' force of gravitational attraction - any object standing motionless on a surface. magnetism - the magnetic force of attraction of iron towards a magnet (N-S poles) or two like poles of magnets repelling each other (N-N or S-S poles) - the two possible magnetic field effects. You see the magnetic field non-contact force in action as a magnet attracts and picks up an iron nail. Initially there is no contact, but once attached there is contact, but the attractive force is still present even if they are in contact. You can have an object is suspended by magnetic repulsion, where there is no contact at all. A simple example is a rubbed charged plastic rod picking up tiny bits of paper. note: gravity only involves attraction (as far as we know? ), but magnetic and electrical forces involve both the forces of attraction and repulsion. A 'force' interaction is a pair of equal and opposite forces acting on two different objects e.g. If you push down on the floor, the floor pushes back up on you. The forces of you and the floor are equal and both objects experience a force. when two objects interact, the forces they exert on each other are equal in magnitude, but act in opposite in direction. The two forces are called an interaction pair of forces and they must be of the same type and the same size but acting in opposite directions on the different objects. On diagrams both forces will be shown by arrows indicating both the direction and magnitude of the vector quantities. When the moon is pulled towards the Earth by the Earth's gravitational field force, there is an equal and opposite force operating as the moon's gravitational field pulls the Earth towards! If the forces were not equal, either the moon would drift away into space or collide with the Earth! Fortunately, its a good example of a gravitational non-contact force operating! The same argument applies to explain the Earth orbiting the Sun, both bodies experience the same numerically equal force, but acting in opposite directions. The diagram below illustrates these two gravitational force situations. Diagram for the two examples above. Two pairs of forces interacting on the same objects! All objects standing motionless on the ground are examples of opposite contact forces operating. The weight of the object acting as a downward force due to gravity is balanced by an upward push from the ground as the atoms are minutely compressed. If the forces were not balanced, either the ground would sink or the object would be raised up! BUT, take care with such descriptions, analysis of the above situation reveals some complications! A bit messy to analyse! Consider the flask of liquid standing motionless on a laboratory bench. There are two sets of forces operating shown by the arrows of opposing direction, but the same length - same magnitude of force for each pair. Both sets of forces are examples of Newton's 3rd Law, but don't mix the two up! The normal contact force due to the weight of the object acting (pushing) down on the surface of the bench (F1) is balanced by the bench under minute compression pushing back up to an equal and opposite extent onto the flask (F2). At the same time both the flask and the Earth (including the bench) are mutually attracting each other (F3 and F4) to an equal and opposite extent due to the non-contact force of gravity (it makes no difference whether the objects are in contact or not, here gravity acts throughout everything!). In the cases described so far there is no resultant force, everything is balanced. If the forces were not balanced and there was some net resultant force, the object would move or be reshaped - something would change! For stationary objects, if the resultant force acting on the object is zero the object is said to be in equilibrium (effectively means a state of balance). A 'free body force diagram' should show every force acting on an isolated object (body) or system but shows none of the forces it exerts on the surroundings. The size of the arrows should indicate the relative magnitude (size) of the force. F1 is the air resistance due to friction between the surface of the bike + cyclist combination and the air, also friction between the wheels and road, and, friction in moving parts of the bike. All three combined oppose the forward motion of the bike and rider. F3 is the thrust or push of the bike from the power generated by the cyclist. If F1 = F3 the cyclist continues at the same speed and direction - constant velocity, net resultant force of zero. See Newton's 1st law of motion. F4 is the normal contact force of the atoms of the road surface pushing back up on the bike. If the bike and rider are moving along smoothly without jumping up or down, F2 = F4, net resultant force of zero. F1 is the air resistance (drag effect) due to friction between the parachutist and the air. F2 is the weight of the parachutist due to gravity, 'pulling' the parachutist downwards. If F1 = F2 the parachutist will fall at a constant speed, a constant velocity if no side wind. F3 is a push on the parachutist by a side wind. If it is zero the parachutist will fall vertically. Note that the parachutist can pull on the cords of the chute to alter the direction of the drag effect to manoeuvre into a safe and intended landing location! (d) Skiing involves the forces of F1 weight (gravity force acting on skier), F2 friction (between snow and ski) and F3 air resistance (friction between skier's clothing and the surrounding atmosphere brushing over the surface). In diagrams to resolve numerical problems, the length of the arrow should equal the magnitude of the force OR a numerical force value indicated on the arrow. At the moment for amusement only! Enter specific words or courses e.g. topic, module, exam board, formula, concept, equation, 'phrase', homework question! anything of physics interest!